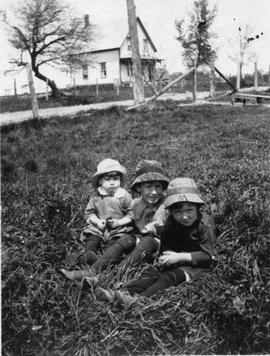 Item is a photograph of three children (Hubert, Bob, and Gerald) on the grass with Sinclair house in background in Lacolle in 1923. The sub-series contains primary source information on the military life Gerald V. Derick in Lacolle from 1942 to 1948. It consists of an Officer's Record of Service, a certificate of service, discharge and retirement documents.